If this LTS is to be put into production, it will most likely be a “Large Touring Sedan,” and not a “Little Touring Sedan,” as Cadillac hopes to release two rear-wheel-drive saloons in the next few years. These include the all-new, larger CTS, and an even bigger, full-sized super RWD sedan that we expect to jump in the pit consisting of the Audi A8, Lexus LS, BMW 7 Series and Mercedes-Benz S-Class. While “Large Touring Sedan” makes the most sense, it’s always fun to come up with other words that fit the bill, like Luxury Tank Saloon. So we’ll turn it to you readers. Thoughts on what LTS stands for, anyone? YES! They need to remind people that full size is Cadillac’s game, not BMW or Mercedes. They need a design that brings back all memories of De Villes and Fleetwoods. The design should benchmark Rolls Royce, in order to make such a design. No fadded and forgotten memories. This is a new car on a new, dedicated platform. There is no need to saddle and weaken the car with an unfair disadvantage right out of the gate with “memories” of cars that nobody younger than 60 years old can remember. It’s a clean sheet for Cadillac to aim high with, not a dusty photo album that lets everyone look down upon. It still has to be more performanceish oriented. My ego would love the second one, but it’s most likely an acronym for Last Touring Sedan — as in the last you’ll ever need. All I got is Luxury Touring Sedan. Luxury Tank Saloon would get my vote, though. AHA! — Know we know where all that Ciel design engineering is going to! Leland Touring Sedan – after Henry Leland, founder of Cadillac. The Cadillac LTS (Luxury Touring Sport-sedan). As Cadillac modern tradition (2003-now), I personally believe Cadillac is trying to approach the “Large Flagship Luxury Car” market with “Art and Science” mindset. This might mean a traditional Cadillac nose (similar to 2014 CTS), with a standard V6 engine, and EATON Supercharged V8 under the hood paired to 8-Speed transmission (Double-Clutch maybe) on higher trims. Transmitted to road surfaces through traditional-to-American Rear-Wheel Drive, however, an All-Wheel Drive might be featured on higher trims (LTS Premium, LTS Platinum…etc). 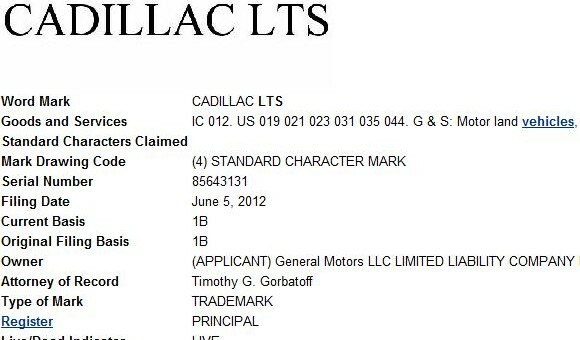 The unmistakable Old-Cadillac inspired design -similar to Elmiraj and Ciel concepts is simply going to happen on LTS. But, my personal favorite….. Cadillac LTS-V (Note that Cadillac is not replacing the V-Series with Vsport. The Vsport is a trim right under the top-of-line V-Series). Competing with Audi S8, Alpina B7, Mercedes-Benz S65 AMG, and Lexus LS460 F. By adapting GM’s Performance technologies as Magnetic-Ride Control, Compact Twin-Turbocharged V8 or V10, All-Wheel Drive, and big Ceramic-Carbon disks with Brembo brakes, wrapped by beafy large “PERILLI” tires. Both Cadillac LTS, and Cadillac LTS-V could make a bold statement. I expect Cadillac will adapt a new design language different that makes LTS standout from other Cadillacs. What I mean is; it’s not a bigger version of CTS and XTS. As a flagship tradition for all automakers, it’s going to feature the future designs of the brand, not follow smaller models designs. Just as the S-Class inspired the C-Class design as an example. LTS = Nonsense. A meaningless acronym befitting common transportation, not the new Standard of the World. Names like these are a slippery slope for a luxury automaker. Already, all models must end with “TS” by their own definition. Ugh. Great cars deserve great names which is why Phantoms and Wraiths, Vantages and Caymans exist. Not to mention Corvettes and Camaros. Look at Lincoln. How seriously can anyone take their model names? MK (pick a letter). MK (pick another letter). And they pronounce it “M-K” when it clearly started out as an abbreviation for “Mark”. Is this supposed to be easier for the gold toothed crowd to pronounce? It just sounds retarded. Lincoln needs an awesome new Continental in the worst way.